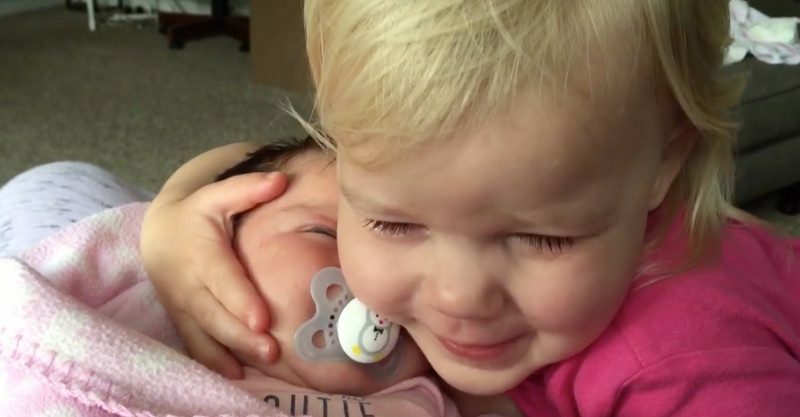 Holding a squishy newborn is enough to turn even the grumpiest of us into puddles of smiling mush, so we’re completely down with this heart-melting moment between sisters. Prepare for a complete overdose of cute! We’ve got a little parenting crush on the gorgeous family from Story of this Life, having previously featured mum Esther Anderson’s highly informative videos on why mums get nothing done and how to escape a sleeping baby. Now the Anderson family is demonstrating how a baby can turn a toddler from grumpy to gorgeous in a matter of seconds. Such is the power of these tiny humans. The video, filmed in May this year, shows Esther holding her then-newborn Tessa, when a crying three-year-old Ellia wakes up in a foul mood (haven’t we all been there). The poor little tot is in a mess of tears as she seeks out her mum, who tells the camera, “This is gonna be a long day. It’s already been a long night.” But as soon as Ellia lays eyes on her snuggly sister, all her grumpiness is forgotten. She tenderly cuddles her, before exclaiming, “I love her so much.” The video has had more than 13 million views on Facebook. This video is most definitely all the feels, and a great reminder that when you’re feeling a little low, give the ones you love a hug – it’s the best medicine in the whole world.